Fleeting appearances, temporary states, fluid identities – the works of the Israeli artist Gili Avissar evade fixed meanings and genres. His artistic practice combines painting, sculpture and performance. 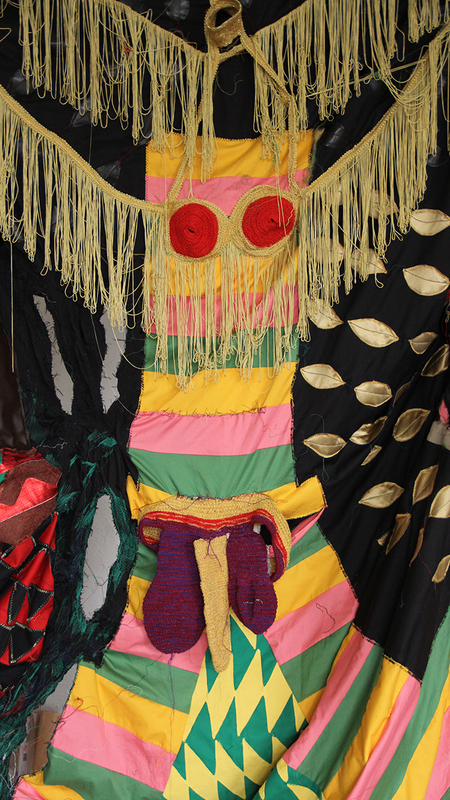 Avissar’s textile objects work in two as well as three-dimensional space, acting both as installations and as costumes for actors. The techniques and materials he uses are reminiscent of the glossy world of fashion and its capacity to conceal the dreariness of everyday life with fantastical creations made out of fabric. Avissar did originally want to be a fashion designer, but then chose the greater freedom that visual art offered in terms of abstraction. Despite all their colourful playfulness, his works on second glance show the meticulous and obsessive way in which the artist sews textiles into shapes and patterns only to cut them up again and put them back together. Avissar’s interdisciplinary works consciously forgo narrative structure and direction. Instead, he gives his material space to evolve and transform. He works and reworks the material until the pieces seem to create themselves. Every attempt to define them would rob them of their ease, like a butterfly pinned in a display case. Gili Avissar was born in Haifa in 1980. He studied at the Bezalel Academy of Art and Design in Jerusalem as well as the Glasgow School of Art. He has received a number of grants, notably from the Artport Tel Aviv Residency Program, Isracard Award from the Tel Aviv Museum, and the Israel Cultural Foundation, the Kunststiftung NRW and the Goethe Institute.